Transitioning from Montenegro, we’ve arrived in Shkoder, Albania, following a two-hour bus ride from Kotor to border-town Ulcinj, Montenegro, and one final ride from Ulcinj to Shkoder. It is fascinating to watch the pace of life here in the semi-rural neighborhood where our guesthouse is located. Humble, vintage cars as well as luxury ones whiz by horse-drawn carts. 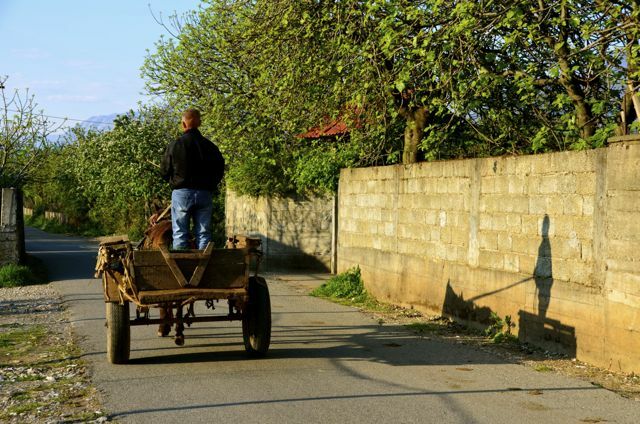 Each morning and late afternoon, we can hear the clip clop of horses’ hooves on the road just outside our homestay’s courtyard, as a farmer sets off for home or work.